The Triumph Terrier was styled to appeal to the young enthusiast. The choices available in the smaller capacity machines were mainly utilitarian two-stroke motorcycles that were dull in performance and looks. The Terrier was a miniature version of Triumph's Speed twin, and it was powered by a four stroke motor, like a proper bike. The following year a larger capacity sports model, the Triumph Tiger Cub, was introduced. 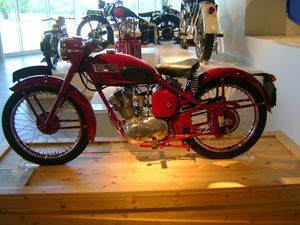 This motor design was the basis for the BSA single cylinder models, from 250 to 500cc. This page was last edited on 10 August 2010, at 17:32.